traveling buddies back in November of 2000, as our plane taxied to leave Las Vegas and head back to New York. I’ve regretted that cheap/ stupid decision for the past 15-plus years, and the Star Trek Experience in Las Vegas is long gone. 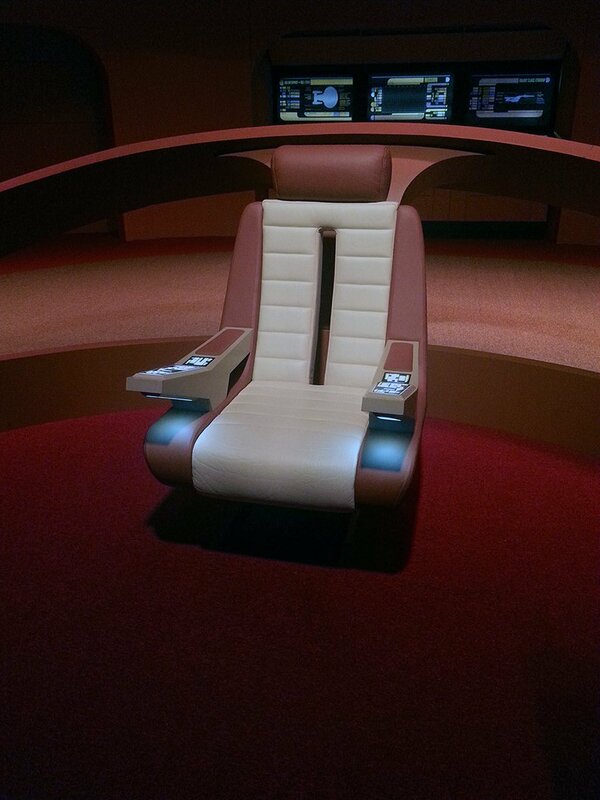 I really thought I’d never get another chance to have a seat in the Captain’s chair. It looks like the Great Bird of the Galaxy has smiled on this former First Officer of the Enterprise-C, (that’s another story) in the form of the Star Trek: The Starfleet Academy Experience exhibit currently showing at the Intrepid Sea, Air & Space Museum here in New York City. 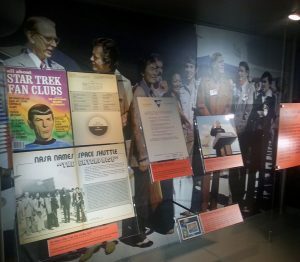 Leading up to Star Trek: Mission New York, one of the many events celebrating the 50th anniversary of Star Trek, the Intrepid is host to a true Trek experience. I’m always excited to visit the Intrepid (if you didn’t know I like space and sci-fi) and this exhibition is right up my alley. It immerses you in the Star Trek universe while touching on real world devices that have been inspired or influenced by Star Trek. But let’s be real: we all want to geek out. As you walk in you’re given a wristband that you sync to their system, which logs your progress throughout the exhibit as you go from kiosk to kiosk learning what you need to become part of Starfleet. Once you’ve created your Academy I.D. you turn the corner and are presented with a 12 foot long replica of the original U.S.S. Enterprise along with a basic intro to the different tv shows, their history, and how the Star Trek universe has influenced popular culture throughout the years. From there you’re greeted by a hologram who proceeded to tell you what to expect as you enroll into Starfleet. The Hologram lets you know about the various divisions you’ll be tested for within Starfleet; Communications, Medical, Science, Engineering, Navigation, Tactical and Command. To get to these tests you pass along a detailed timeline of the Star Trek universe. and abilities, so each prospective cadet must take a brief 5 question quiz and complete a hands-on exercise in that field. I wasn’t looking for a career in Communications so I skipped the learning Klingon kiosk and went to Medical to use a tricorder to diagnose a patient. At Science you will have to scan for a suitable planet to land on, plot a course through space at Navigation, and of course phaser drills at Tactical. There were a few times I felt that my favorite show Star Trek: Deep Space Nine was underappreciated, but the exhibit is populated by cool props and costumes from all the shows and movies, each section with a kiosk showing clips from the shows in regards to that specialty. These include examples such as Uhura working at communications, or Sisko talking to Worf about what it means to be in command. One of the things that I did love, wasn’t about the show itself but the people that were there, especially this grandmother who brought her five grandchildren to the exhibit. I asked her if she was there for the kids or for herself to which she replied herself. As I watched the children running around and having as much fun as their grandmother, I realized they might have been dragged here but they were well on their way to becoming future cadets. The most amazing part of this exhibit is the final station. 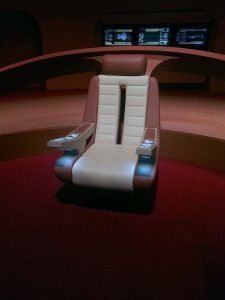 You pass one last display about the Captains and their First Officers, turn to the right, and you’re on the bridge of the Enterprise-D from Star Trek: The Next Generation. You can check out the Science and Tactical stations on the upper deck or sit at conn or the Captain’s chair, making up for my error from 15 years ago. 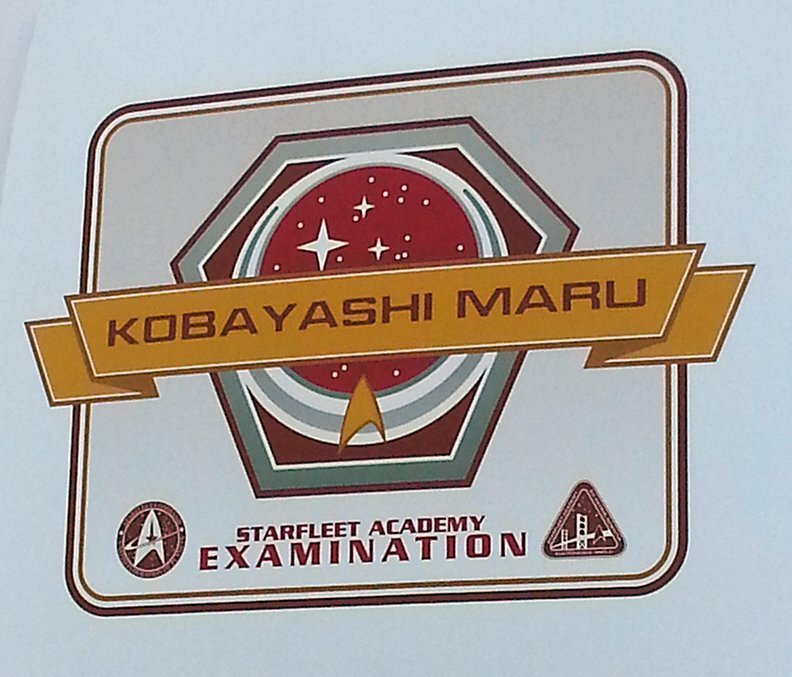 They kick it up a notch by incorporating all of the previous stations and have you take the Kobayashi Maru exam made infamous in Star Trek II: Wrath of Khan. 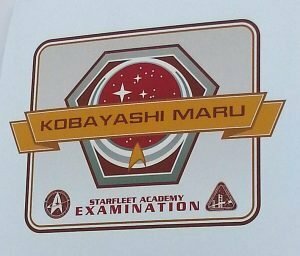 With everything you learned from Tactical, Engineering, and Communications, you are now in command and have to decide the fate of the Kobayashi Maru, while 3 Klingon Battle Cruisers are attacking in this final exam. At the end of the exhibit, along with your transporter video and alien image, you’re given a score tabulated from all the stations you’ve used and given what they consider your best career choice in Starfleet. As Scotty and Chief O’Brien are two of my favorite characters from the shows I was happy with being accepted into the Engineering program. For hours and pricing on the exhibit visit the Intrepid’s website for more information and then Boldly Go!